PennsylvAsia: Chuseok (추석) celebration at Pitt, September 30. 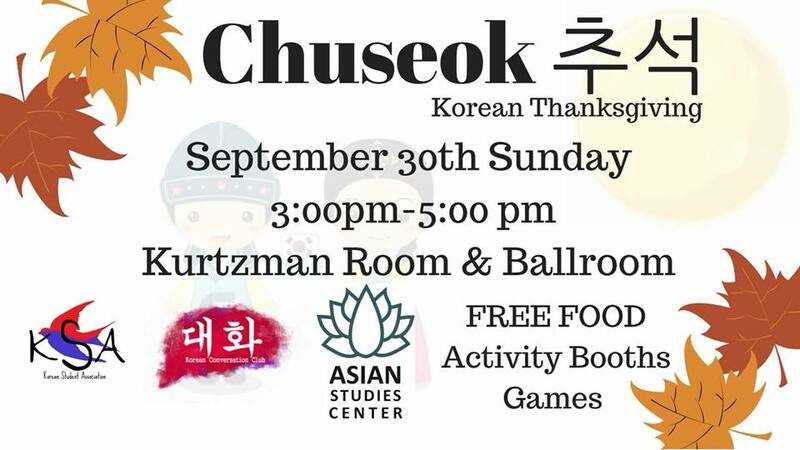 The University of Pittsburgh's Asian Studies Center, the Korean Student Association, and the Daehwa Korean Conversation Club will present a Chuseok celebration on Sunday, September 30. Join Pitt KSA, Daehwa Korean Conversation Club, and the Asian Studies Center in celebrating one of the most important Korean holidays: Chuseok (추석)! Chuseok, aka mid-autumn festival, is a day for families to gather and give thanks to their ancestors for plentiful harvest. We will have Korean games, opportunities to learn more about Korean culture and most important of all, there will be KOREAN FOOD! Come out and celebrate with us!! It runs from 3:00 to 5:00 pm in the William Pitt Union's Kurtzman Room (map).